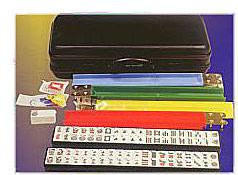 Sturdy attaché case holds 168 non-fading tiles, 4 high impact tile racks, tile holders, chips, dice and instructions. Buy 1 for $121.94Buy 2 / Save $6.51!Buy 3 / Save $24.40! Size (inches): 20.47" X 4.72" X 9.06"
I was very pleased with this mahjong set. The same quality tiles and attache case typically sells for a much higher cost than offered by Zooscape. This was my first purchase and will certainly check with Zooscape for additional items. A speedy delivery was also noted. Thank you. I was impressed!